It looks like Google is pulling a Steve Jobs with Chrome: They are going to eliminate the Caps Lock key from all the notebooks made for that operating system. Why? Because they know better and we are all idiots. 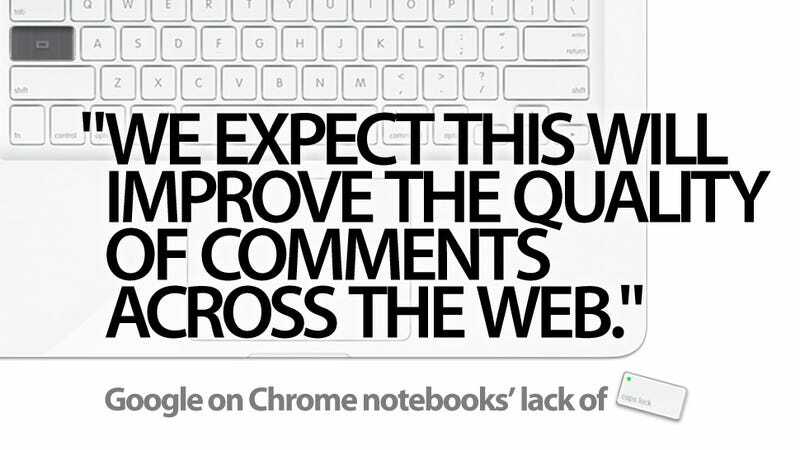 According to Google, this will improve the quality of the comments, because people will not be able to write all in capital letters. I'm not a fan of the caps lock key myself. I never use it, so it can go to hell, for all I'm concerned. But taking away choice from people is not good, especially when this is not going to improve the quality of comments. FIRST, PEOPLE WOULD STILL BE ABLE TO WRITE AS MUCH AS THEY WANT IN CAPITAL LETTERS. SEE, MY LEFT PINKY DID THAT, NOT THE CAP LOCKS. then, people would be able to write all without using any caps at all, which i find just as annoying as writing all in caps. maybe the next step is to enforce proper capitalization for all text fields. and is google also going to forbid the unnecessary repetition of exclamation and interrogation marks!!!!!!???? ?